The built-in mics can be rotated to select a recording pattern of 90° or 120° for versatility.. The H4n records to readily-available SD or SDHC flash memory cards at capacities up to 32GB. This type of media features no moving parts, and is an incredibly stable platform, ensuring the safety of your data. The built-in speaker lets you quickly monitor recordings without having to bother with headphones. The unit can operate on a pair of standard AA batteries. The recorder's Stamina mode allows it to record continuously for up to 11 hours at CD-quality settings. The recorder can also be powered with the included wall adapter or by USB power. Built-in editing features let you make basic adjustments, while the included Cubase LE software lets you perform more advanced editing functions on a computer. 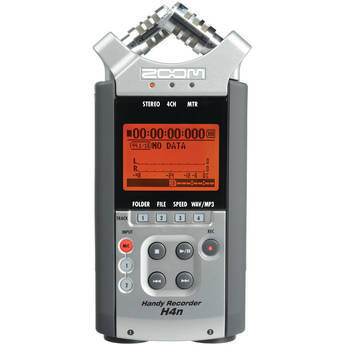 A mid-side stereo decoder allows you to use an external mid-side mic setup, while a mono mix function lets you convert a stereo recording down to mono, ideal for interviews. Playback speed can be adjusted from 50 to 100%, making it easy to learn a song or language, or analyze recordings. You can also choose single or all repeat modes, and A-B repeat. An optional remote control gives you full access to recording and playback controls, and is ideal for eliminating handling noise 1.